Some foods just scream ‘health’, and few fruits exude health and vibrancy quite like raspberries. These beautiful, colorful little berries make a festive, fruity addition to salads, steaming bowls of oatmeal, and infused water. Their delicious, addictive flavor also makes them excellent for serving atop ice cream, baking into brownies, cookies, and cakes, and of course, as a key ingredient in homemade raspberry jam. They are versatile, but they are also delicious enough that many of us enjoy them on their own as a healthful, energizing sweet treat. We often equate healthy with harmless, so intuition tells us that raspberries would make the perfect addition to our rabbit’s diet. But, as anyone who has ever raised a companion animal has come to learn, our intuition is not always right. So, is it safe to give your furry friend a couple of raspberries with their breakfast? Can berries make your bun as healthy as they make you? Can you give your rabbit raspberries? Yes, rabbits can eat raspberries in small portions. Fortunately, these delicious little delicacies do not seem to contain any chemicals that are toxic to rabbits, so this food is perfectly safe to experiment with. Your rabbit will not suffer from kidney or liver failure as a result of eating too many raspberries. That does not mean that you can let your bunny binge! Though raspberries are loaded with beneficial micronutrients and antioxidants, rabbits are not really designed to process fruit, so it can be very easy to overdo it. Your furry friend has a serious sweet tooth and will not regulate their own fruit consumption, so it’s important that you make sure to serve them small portions. If you’re looking for great rabbit treats, you have found them—raspberries are way better for your bun than most of the treats you will find sitting on the shelves in pet stores. Many pet parents, assuming that the brightly colored carrot-shaped treats on the shelf are formulated for their rabbit, shell out the cash for heavily processed, overpriced junk food that makes their pet fat and unhealthy. A lot of the cute, flashy foods sold as treats are little more than corn, artificial dyes, and preservatives. They are the worst sort of empty calories! Compared to these treats, raspberries are a nutritional goldmine. These little berries are loaded with important micronutrients like Vitamin C, copper, Vitamin K, manganese, and even biotin. Like all berries, they are also loaded with antioxidants that may benefit long-term health. One study performed on castrated obese rabbits found that supplementing their diet with antioxidants like those found in raspberries helped to improve their blood glucose levels and their insulin sensitivity. Buns who were fed antioxidants also experienced improvements in liver health—they managed to decrease the amount of fat in the liver. Studies performed on humans and other animals have supplied more evidence in favor of the beneficial effects of antioxidants. They are believed to improve overall health by protecting against the harmful effects of volatile particles called free radicals, which damage body cells. Sometimes that cell damage is relatively harmless, but sometimes, it results in mutations that can lead to various ailments. Some believe that free radical damage may be a factor in the development of cancer, heart disease, diabetes, dementia, and other diseases. Some go so far as to blame aging solely on free radical activity, but there is not enough research to support that claim. 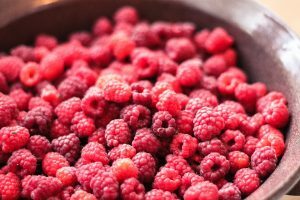 So, even though antioxidants certainly will not make your rabbit immortal and immune to all diseases, choosing antioxidant-rich treats such as raspberries may help protect their health in the long term. Berries and other fruits provide a nutritional boost that many corn-based treats do not. 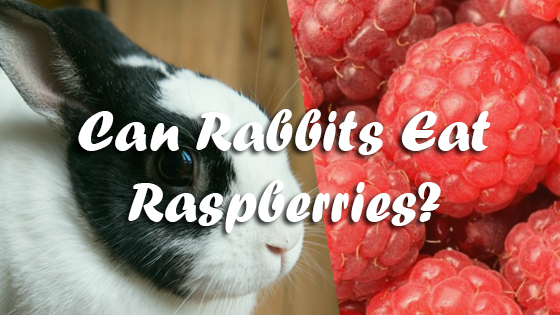 Raspberries are a great source of all sorts of beneficial micronutrients, but they still should not make up a large part of your rabbit’s caloric intake. Unlike omnivorous humans, rabbits are grazing herbivores who have evolved to eat large amounts of fiber and very small amounts of sugar. For humans, raspberries and other fruit are considered high-fiber foods. For rabbits, however, they do not have nearly enough fiber. If you feed your bun too many raspberries, their digestion will suffer. In severe cases, this can result in severe gastrointestinal problems, including gastrointestinal stasis and dangerous imbalances in their gut flora. Rabbits who eat too much fruit are also likely to suffer from weight gain (which can lead to obesity) and nutritional imbalances. Raspberries are way too high in sugar and way too low in fiber to keep your rabbit healthy, so they should only be given as treats. So, while you shouldn’t let your rabbit eat raspberries with every meal, they do make an excellent treat option. If your bun is looking for something new and exciting, try using these delightful little berries as a treat. Most rabbits can eat around two tablespoons of fruit per day without suffering any negative health effects. Can Rabbits Eat Squash? Can Rabbits Eat Radishes?